Jay Kaplan was recently a guest on TD Ameritrade The Watch List discussing where he is finding opportunities in small-cap stocks. Jay Kaplan appeared recently on Nasdaq Trade Talks discussing long-term contrarian opportunities in small-cap banks and trucking. Jay Kaplan was featured in MarketWatch.com discussing opportunities in small-cap community banks and Royce Total Return Fund. 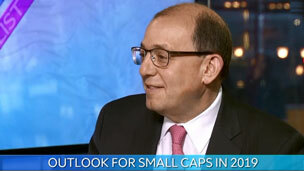 PM Jay Kaplan joined host Sue Lee on Asset TV's Masterclass: Small-Caps March 2019 to discuss why he’s less concerned about recession than inflation and where he is finding opportunities in domestic small-caps. PM David Nadel joined Liz Claman for Asset TV's Outlook 2019: Looking Beyond the U.S. for a Bright 2019 to discuss where he’s finding opportunities in international small-cap stocks. Royce Special Equity Fund, managed by Charlie Dreifus, was mentioned by Morningstar as an attractive small-cap value fund. PM David Nadel joined Asset TV's Masterclass: Global Investing to discuss the global markets and where he is finding opportunities in international small-cap stocks. Co-CIO Francis Gannon was a guest on "Bloomberg Daybreak: Americas" to discuss Royce’s outlook on small-cap stocks in the current volatile market. Co-CIO Francis Gannon joined Asset TV's 2019 Outlook Masterclass to discuss the recent market correction and his outlook for 2019. The Royce Fund’s Board of Trustees has approved plans of reorganization for four open-end mutual funds. Portfolio Manager Charlie Dreifus joined Asset TV's Small-Cap Masterclass to discuss issues in small-cap stocks and how investors can deal with current volatility. Royce & Associates, LP is subadvising a new portfolio—the Legg Mason Global Premier Small-Cap Equity Fund—our first product to be made available to Japanese investors. David Nadel participated in a Legg Mason webcast sponsored by Wealth Management to discuss the opportunities in international small-cap stocks. The Royce Fund’s Board of Trustees has approved a plan of liquidation for Royce International Discovery Fund. Francis Gannon was quoted in Suzanne McGee’s piece in The Wall Street Journal, “A Reality Check for Small-Stock Investors,” discussing whether or not the recent small-cap selloff is the end of the cycle or just a pause. Jay Kaplan appeared on Nightly Business Report’s weekly Market Monitor segment to discuss opportunities he is finding in undervalued small-cap technology stocks. Portfolio Manager Jay Kaplan joined Asset TV's Small-Cap Masterclass to discuss value in small-cap technology, being a “technology pick and shovel” investor, rising rates, and the prospects for small-cap value in 2019. Chuck Royce was mentioned in a Forbes article by John Dorfman about stocks Dorfman picks yearly for his portfolio that are purloined from money managers he respects. In an interview with Jill Malandrino on Nasdaq’s TradeTalks, Francis Gannon spoke about inflation and rising interest rates, and how the two may impact small-cap stocks. Royce is pleased to announce important changes to our Deep Value portfolio team. In an interview with Oliver Renick on TD Ameritrade Network-Nasdaq, Bill Hench talked about how industrials offer reasonable valuations and growth potential. Bill Hench talked to Philip Van Doorn of MarketWatch about the prospects for aerospace and defense stocks as the U.S. military budget is set to increase. Share Class Conversions for Institutional Shares took place in June. David Nadel was featured in the website’s showcase of three portfolio managers who’ve enjoyed recent success. In an exclusive interview with Consuelo Mack WealthTrack, David Nadel talks about the attributes of international small-cap stocks and three holdings he currently likes. Portfolio Manager David Nadel sat down with Julie Hyman on “Bloomberg Markets” on 4/27/18 to discuss what’s driving international small-cap results and his recent research trip to Japan. On May 1st, Charlie Dreifus celebrated his 20th anniversary at Royce and as portfolio manager of Royce Special Equity Fund. Share Class Conversions for K and R Class Shares took place in April. PM Jay Kaplan appeared on CNBC’s Power Lunch to talk about the recent market and three small-cap stocks that he likes. On 4/16/18, David Hogg tweeted outdated information about a firearms manufacturer held by several asset managers, one of which was Royce. Portfolio Manager Bill Hench Bill Hench joins Asset TV's Small-Cap Masterclass to discuss volatility, tax reform, and current opportunities in the asset class. Bill Hench appeared on cnbc.com and CNBC Asia to discuss the current state of small-cap stock performance. The Fund received a 2018 Thomson Reuters Lipper Fund Award in recognition of its performance for the three-year period ended 11/30/17 in the International Small/Mid-Cap Growth Funds category. Morningstar’s Russ Kinnel makes "The Case for Royce Special Equity Fund"
Morningstar’s Russ Kinnel, the firm’s director of manager research, says that Special Equity has appeal thanks in part to its distinctive focus on accounting issues. ChuckRoyce on WealthTrack: Where Are Today's Small-Cap Opportunities? In an exclusive interview with Consuelo Mack WealthTrack, Chuck Royce talks about the current challenges facing active management, why he thinks value investing will be rewarded, and where he is finding opportunities in the small-cap universe. Morningstar’s Russ Kinnel again looks at Royce Special Equity Fund in "12 Funds for 2018 and Beyond"
Morningstar’s Russ Kinnel, the firm’s director of manager research, sees Royce Special Equity Fund in the context of the shift in market dynamics in 2018. Barron’s Asks Francis Gannon: Are There Unseen Dangers in Small-Cap Stock Rally? Co-CIO Francis Gannon talks with Barron’s about what, if any, unseen dangers may be in the small-cap stock rally. Morningstar’s Russ Kinnel looks at Royce Special Equity Fund in a discussion of "3 Key Themes for Investors in 2018"
Morningstar’s Russ Kinnel, the firm’s director of manager research, discusses 3 key themes for investors in 2018—one is to look at small-cap value funds such as Royce Special Equity. Morningstar Includes Royce Special Equity Fund in a List of "3 of Our Favorite Value Funds"
Morningstar Analysts discussed three value funds they like, highlighting Royce Special Equity Fund's emphasis on quality and clean accounting. Portfolio Manager David Nadel sat down with Aleksandra Michalska of Reuters on 1/10/18 to offer his outlook for international small-cap stocks. Portfolio Managers David Nadel and Mark Rayner are included in Citywire's list of international small- and mid-cap fund managers. Francis Gannon in CBS MoneyWatch: "Small-cap stocks may be poised to move higher." Co-CIO Francis Gannon tells CBS MoneyWatch why small-cap cyclicals with global reach currently present an attractive opportunity. Morningstar Includes Royce Special Equity Fund in its List of "Small-Value Funds Worth a Look"
Morningstar highlights Royce Special Equity Fund's unique focus and long-term record. Barron's Jack Willoughby talks to Buzz Zaino: "Will Index Funds Share the Nifty 50's Fate?" about the potential risks of investment trends. Portfolio Manager Jay Kaplan weighs in with a small-cap update on an Asset TV panel on the asset class. Senior Investment Strategist Steve Lipper joined Nasdaq TradeTalks to discuss which areas in small-caps could present opportunities for investors. Portfolio Manager David Nadel discusses opportunities in international small-caps with Bloomberg Markets. Bill Hench discusses his deep value approach and opportunities in the current small-cap market on MoneyLife with Chuck Jaffe. Co-CIO Francis Gannon talks to Liz Claman about his outlook for small-caps and where Royce is finding pockets of innovation. Portfolio Manager Jay Kaplan joins Asset TV's Small-Cap Masterclass to discuss small-cap performance and why active management could shine. Portfolio Manager Bill Hench joins CNBC PowerLunch to discuss where he’s been finding opportunities in small-cap technology companies. Royce & Associates has signed the UN-supported PRI. Co-CIO Francis Gannon discusses key themes within the small-cap space, and tells financial journalist Liz Claman how fiscal policy and a reviving global economy could impact smaller companies. Co-CIO Francis Gannon speaks with MarketWatch about wage growth and encouraging small-cap company earnings. Portfolio Manager Charlie Dreifus discussed the importance of corporate governance and accountability with the CFA Society of Nebraska. An interview with CNBC PRO Talks in which Chuck Royce details his thoughts on the small-cap market and where he's currently finding opportunities. What does Portfolio Manager Jay Kaplan like about these three small-cap stocks? Jay Kaplan discusses the construction and core principles of Royce Total Return Fund. Portfolio Manager Bill Hench joins Asset TV's Small-Cap Masterclass to discuss what's driving performance for the asset class. Jay Kaplan discusses where he is finding value and companies he currently likes on MoneyLife with Chuck Jaffe. Portfolio Manager Lauren Romeo joins Welling on Wall St. to discuss where she is finding opportunities in the small-cap space and what's next for high quality small-cap. Portfolio Manager Chuck Royce and Co-CIO Francis Gannon join Welling on Wall St. for an exclusive interview. Asset TV Active Management Masterclass: Why Active Now? Senior Investment Strategist Steve Lipper makes the case for active management. Steve Lipper in MarketWatch: How should active management fit into one's portfolio? Steve Lipper tells MarketWatch why investors considering an active management strategy should look at small-caps. Chuck Royce and Steve Lipper joined Grant's Conference to discuss overlooked innovation in small-cap. Portfolio Manager Jay Kaplan tells MarketWatch what he likes about the small-cap human capital space. Morningstar includes Royce Special Equity Fund in its list of "8 Relatively Low-Risk Equity Funds." Portfolio Manager Charlie Dreifus shares one of his key investment rules and how he ensures his comfort level. Portfolio Manager Charlie Dreifus joins Consuelo Mack WealthTrack to discuss the small-cap market. Portfolio Manager Bill Hench tells MoneyLife with Chuck Jaffe where he is finding opportunities in the small-cap market. Royce Pennsylvania Mutual Fund makes Financial Planning's list of funds with strong 40-year performance. Co-CIO Francis Gannon tells the Closed-End Fund Association what the recent key shifts in the small-cap market mean for investors and why the closed-end structure is advantageous in the small-cap space. Portfolio Manager Jay Kaplan shares where he is finding opportunities in the small-cap space with Financial Advisor. Asset.tv 2017 Outlook Masterclass: What's Next for Small-Caps? Francis Gannon's thoughts on the opportunities for small-caps and active management in 2017. Forbes: "Royce Special Equity Fund Earns Its Fees"
Royce Special Equity Fund is a small-cap value option that "breaks the mold and is worthy of a second look." Steve Lipper explains why he is optimistic about small-caps and how they could be a smart investment addition on MoneyLife with Chuck Jaffe. Morningstar describes Royce Total Return Fund as a "solid option for conservative investors seeking exposure to small-cap stocks." Portfolio Manager Bill Hench joins TheStreet to discuss four small-cap value stocks he's bullish on. Lipper on CNBC: Active Management Comeback Ahead? Senior Investment Strategist Steve Lipper joins CNBC's Trading Nation to discuss the connection between value-led markets and active management. Portfolio Manager Jay Kaplan discusses his small-cap retail picks with MarketWatch. Chuck Royce comments on increasingly complex security trading systems in The Economist. Royce Opportunity Fund is featured in a Morningstar commentary on the third quarter of 2016. Portfolio Manager Jay Kaplan joins host Chuck Jaffe on the MoneyLife with Chuck Jaffe financial talk show. Francis Gannon in Morningstar: "Is It Time to Get Small?" Co-CIO Francis Gannon offers Morningstar his insights into current small-cap opportunities. Portfolio Manager Jay Kaplan joins Nightly Business Report to discuss his small-cap stock picks and market volatility. With the Russell 2000 Index outperforming the large-cap S&P index so far in 2016, Portfolio Manager Bill Hench discusses areas of interest in the small-cap space. On "Countdown to the Closing Bell" Co-CIO Francis Gannon discusses the current market environment and his small-cap stock picks with Liz Claman. Barron's Talks to Chuck Royce: "A Value Investor's Dream"
"Small-cap expert" Chuck Royce tells Barron's why he's bullish on alternative asset managers and other financial services firms. Francis Gannon in FT Adviser's: "Guide to U.S. Small and Mid-Cap Funds"
Co-CIO Francis Gannon is featured in FT Adviser's "Guide to U.S. Small and Mid-Cap Funds." Francis Gannon, Co-Chief Investment Officer at The Royce Funds, discusses major transitions in the small-cap space, specifically the resurgence of value and the importance of earnings and fundamentals, with financial journalist and television host Liz Claman. A piece on Investing "Maestro" Chuck Royce kicks off Furey Research Partners' "Small-Cap Legends" Series. Does Accountable Accounting Matter in Small-Caps? In today's uncertain environment, why is ethical accounting so important? Morningstar: Royce Special Equity Fund "A Defensive Small-Cap Strategy"
Morningstar's Alex Bryan says "Risk-averse small-cap investors can feel good about Royce Special Equity under Charlie Dreifus." Morningstar author Russ Kinnel describes Portfolio Manager Charlie Dreifus as a "very value-conscious investor" in a discussion about investor returns. Barron's: "Charles Royce Passes CEO Baton to Clark; Will Continue Stockpicking"
Barron's reporter Crystal Kim interviews "stockpicking legend" Chuck Royce and soon-to-be CEO Chris Clark on the firm's succession planning. Two Royce Funds are highlighted by Morningstar in an article focused on why newly reopened funds may offer interesting opportunities. Portfolio Manager Steven McBoyle and Senior Investment Strategist Steve Lipper attended Berkshire Hathaway's shareholder meeting and shared their small-cap perspective with the CFA Society of Nebraska. Portfolio Manager Jay Kaplan shares why he thinks now is the time to invest in small-caps, particularly small-cap value. David Nadel on The Street: "Four International Stocks With Room to Run"
Portfolio Manager David Nadel joins The Street to discuss four international small-caps that he sees as strong businesses.